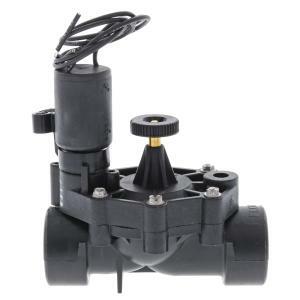 The Irritrol 700 Series Ultra Flow plastic 24 VAC irrigation valves are an industry leader for durability and performance. The straight through flow path dramatically reduces pressure loss and is compatible with dirty water applications as well as clean, potable water sources. The 700 Series valves offer slow closing design for reducing water hammer, wide flow range making it ideal for low flow applications such as in nurseries and greenhouses, and extremely durable glass reinforced nylon with stainless steel and brass construction. The nylon reinforced Buna-N diaphragm and valve seat make a leak-proof seal. This compact, low profile valve includes encapsulated injection molded solenoid with captive plunger and manual internal bleed for easy maintenance.